I like to visit UNESCO World Heritage sites when travel allows because they are uniformly interesting. Villa del Casale is no exception as it has some of the best preserved and most extensive Roman mosaics anywhere. The place is situated off the main tourist path in the central hills of Sicily and was a little hard to find, but the lovely well-preserved floor mosaics make it worth a little effort to get to. It’s about 3 km from the town of Piazza Armerina. Villa Romana del Casale was built in late Roman Empire, around the middle of the 4th Century AD, as a hunting lodge for a wealthy Roman (whose name is unknown). The overall architecture is similar to many villas of the era — including courtyard, baths, private apartments, etc. It is thought the complex was inhabited for the better part of two centuries. Most of the decorative items in the villa, like statues, are gone, either stolen or destroyed over the ages, but the floor mosaics are surprising well preserved. This is largely because the villa was covered by a landslide in the 12th century, protecting them for hundreds of years. 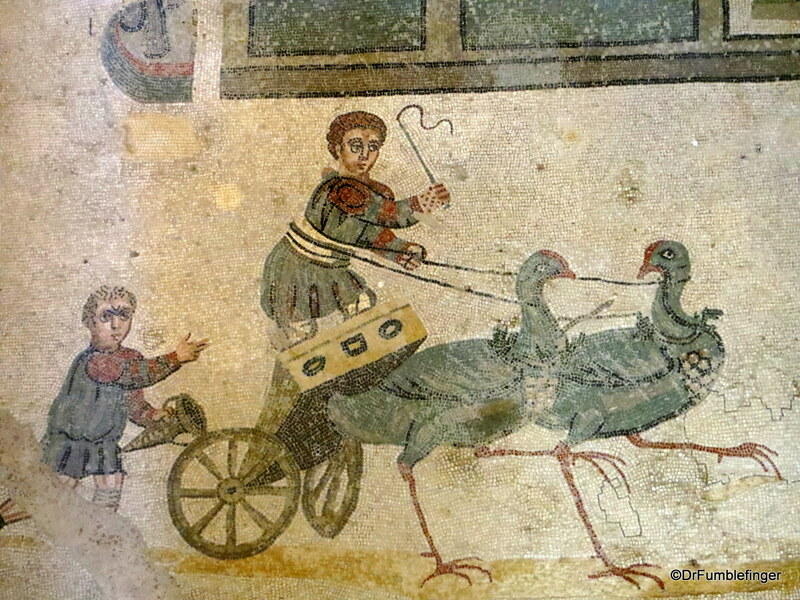 The mosaics are known for their rich color and life-like depictions of scenes from their time. The villa was almost entirely forgotten and the area around it was used for farming. The first excavations of the villa occurred in the 1800s when some mosaics were discovered, and the complex has undergone extensive excavation and restoration over a period of many decades lasting well into the 20th century. A roof and an elevated walkway to observe and protect the mosaics were the final touches to the restoration. You enter the Villa via a long walkway from the parking area and pass several Roman features on the way to the interior, including outside arches and columns framing views of the Sicilian hills. 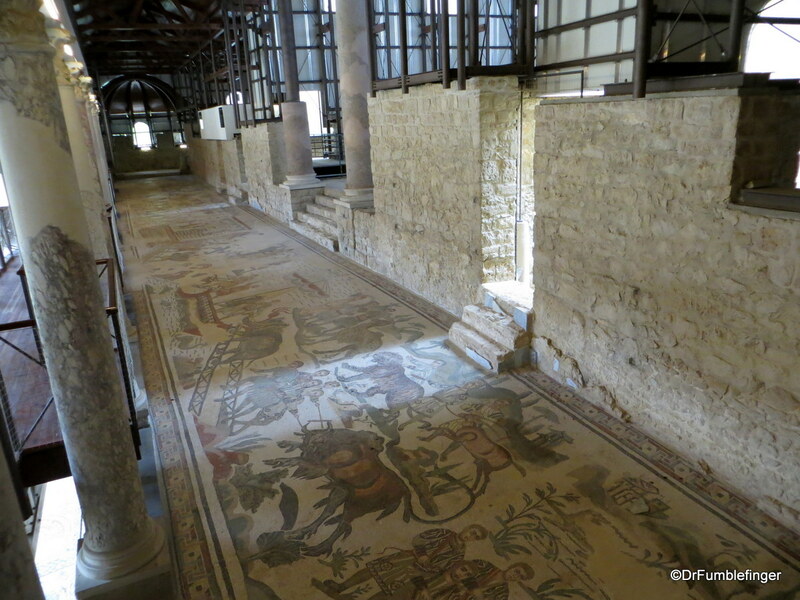 You get to see the mosaics as you enter the building, past the baths, a peristyle with living and guest rooms, a basilica (public hall) and a triclinium (dining area). Most of your viewing occurs from elevated walkways that allows access to most of the rooms in the villa — each with a unique floor design. Much of the light is natural and it ranges from excellent to very poor. Some of the best mosaics were in dimly-lite rooms making them hard to photograph properly (no flash photography allowed). 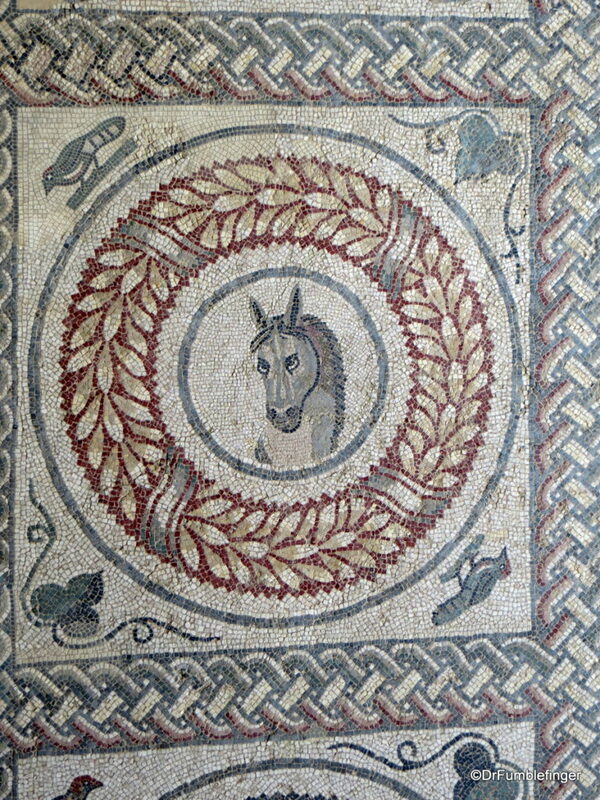 Many of the mosaics are quite simple — basic patterns, animal heads and such (it is a hunting lodge after all). Others are more detailed including action scenes of people hunting and fishing, chariot races, battle scenes, even exotic African animals being transported by ship. Some are quite cute, like those of children in small chariots being pulled by geese or goats. While the themes of the mosaics are Roman, it is thought that North Africans likely were the main craftsman of these floors. The artistic skill and thousands of man hours to assemble these beautiful mosaics will impress all. 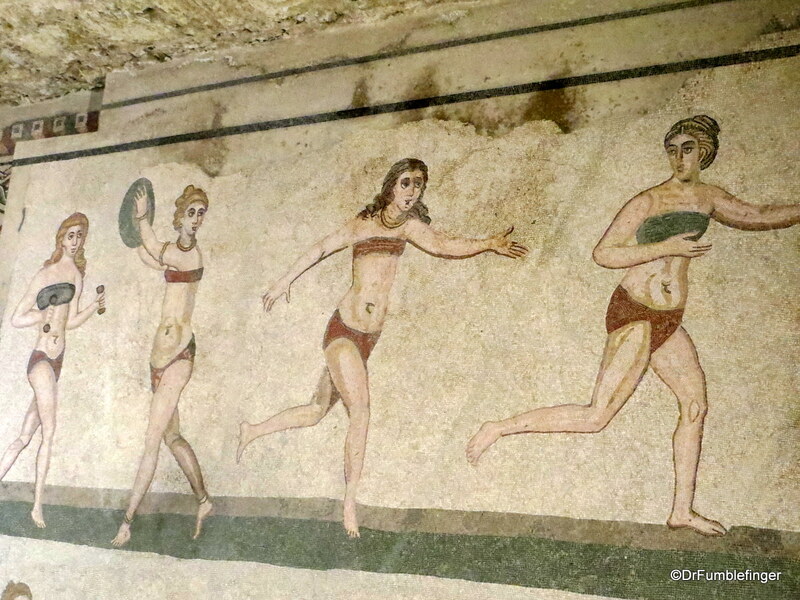 One of the most famous mosaics at Villa Romana del Casale is the floor with the “bikini babes”. These feature women who are exercising and who seem clad in 2 piece swim suits — likely just athletic wear from that time. Nothing like them exists elsewhere. A rather unique and interesting destination. It will take a half-day to see the mosaics in a reasonably relaxed and detailed manner. Highly recommended! (Click on thumbnails to enlarge, right arrow to advance slideshow).